New hotel with large rooms. Very good bathroom. Excellent breakfast. Only 10 min walking to the old town. 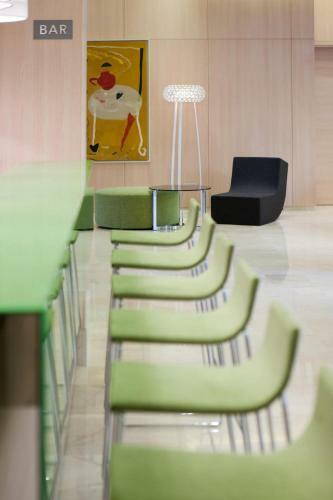 Situated next to Devesa Park, DoubleTree by Hilton Girona is 300 metres from Girona Auditorium and Convention Centre. 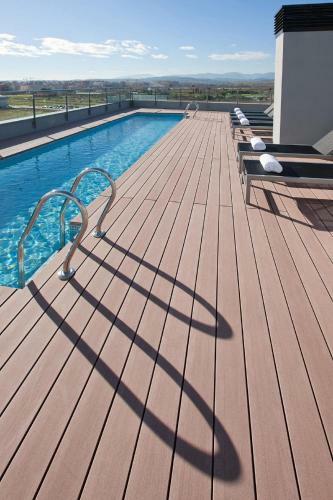 This modern hotel has a rooftop swimming pool and offers free WiFi throughout. Rooms feature bright, stylish décor and wooden floors. Each room includes a flat-screen TV, pillow menu and minibar. 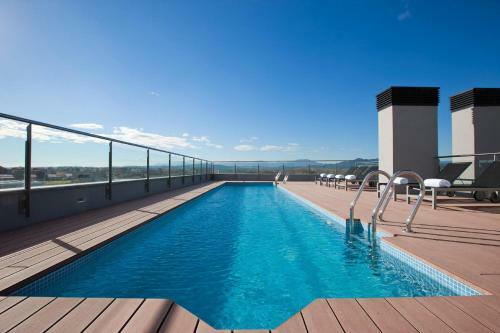 The top floor of the hotel has a terrace with amazing views over Girona. 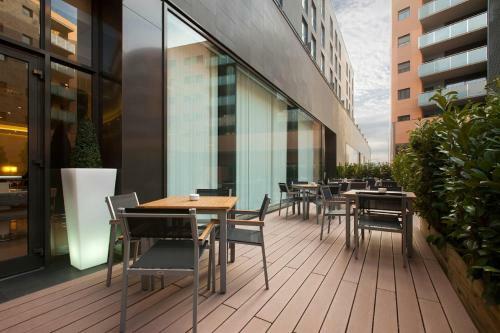 DoubleTree by Hilton Girona has a terrace bar and a restaurant serving Mediterranean cuisine. The popular bars and restaurants around Plaza de Independencia are within a 10-minute walk. 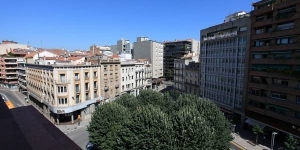 DoubleTree by Hilton Girona is a 10-minute walk from the old town and a 20-minute walk from the city’s Cathedral, Jewish Quarter and the old city walls. The famous El Celler Can Roca Restaurant is 5 minutes' drive away. PGA Catalunya Golf Club is a 20-minute drive away. The beaches of the Costa Brava are 35 km away. Girona Airport can be reached in around 20 minutes by car or bus, and Barcelona is an hour’s drive away. La ubicación, no está en el centró de la ciudad, pero si muy cerca. La dedicación y amabilidad de los empleados. La decoración de las habitaciones y del hotel`. Surgió el problema, en última hora, de que no tenian disponibilidad de cuna para el bebé y lo solucionaron rapidamente dandonos una suit con dos camas de matrimonio. El problema solo fue la primera noche y, la segunda nos facilitaron la cuna en la misma habitación. The bar seemed a little small and didn't seem to be open at all during our 3 night stay. El personal, diseño y ambiente. Las almohadas son un poco bajas. Tot el voltant es zona verda i el parquing es molt car. La atención del personal fue excelente al igual que la limpieza. La ubicación. Había un paseíto de unos 15' hasta el centro. Por lo demás, todo perfecto. Decoración vanguardista. Personal correcto . ambiente tranquilo. Limpieza muy bien Terraza con piscina muy bonita. Pensaba que estaba mas céntrico. Staff was friendly and very communicative. Wi-fi perfectly working and cleaning was excellent. The city center is about 10/15 minutes by walking which is fine. Nice hotel, really new and clean. Staff was very friendly and helpful. Room was well equipped, comfortable and nicely decorated. Finding the right bus stop to get back from down was not easy, so we got a cab. Very cheap - so no big deal. Very kind and supportive employees. The door of my room was the last one in the aisle and there was no light on that spot. I needed to light my phone in order to find the door lock. The location is good and the hotel modern. The check-in/out staff were really helpful and friendly. The dinner in the restaurant was superb and at a very reasonable price. I would like to especially mention the girl who served me in the restaurant, she was wonderful and so was the service. The bed and pillows were extremely comfortable. I've been to Girona before but this was my first time in this hotel, but it will be my choice when I return. Everything about the hotel was relaxed with a very personal feeling. Breakfast was great and there was good parking on site. Fabulous hotel and staff. :-). Thanks to all the staff. Gracias a todos. Superb well appointed hotel with a contemporary interior. Convenient for a 10 min walk to town. Very secure car park. The staff was rather rude, or maybe was nice but for the people looking like they had a million dollar in their pocket… I'm sure they must have more intense perception of the splendor of the hotel that it actually deserves. When we came it turned out that someone from the hotel staff cancelled our reservation in the internal hotel system, because they did not manage to charge my credit card. Obviously no one felt obliged to inform neither booking.com nor me, so when we came we got the information: your reservation has been cancelled. When it turned out that it was their fault, they started to managing the room for us, while we had to wait. Finally we got the room for smokers (I don’t have to add that I’m not a smoker…). Moreover, we had to pay for the hotel although we got no information the previous payment was cancelled, so we got no idea if they already charged us or not, but of course it's the problem of the client, we could leave - yeah, great option. And after all, even no word of "sorry". Just like that. Localization - not close to the center and close to the loud street Air conditioning – loud and you cannot regulate the temperature by yourself, switching it off also needs a higher academic knowledge. The value for money is rather regular. For the second time there were construction works on the pool so could not use it, which was the reason we booked it. Also the receptionist refused to check us in without 2 passports which was not the case the first time we stayed there. Very friendly staff,easy walk to the old town. Not easy to find - even though it is sign posted. 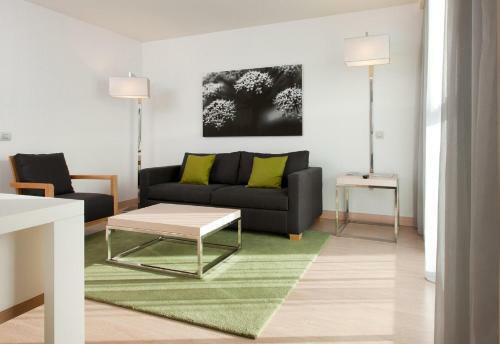 Nice rooms with a modern and interesting design, plus a very quiet and restful location. The green colour in the rooms. Quite a new hotel, clean, english-speaking personnel. Relatively small rooms, no king-size beds despite the offer, the roof terrace closed "due to restoration". The guest is informed at the arrival that "bringing the food to the room is prohibited"
Modern hotel, helpful and friendly staff, good decor. The provision of internet access is a joke. It's limited to 100MB of data and speed is throttled. This meant it was barely possible to check email as it took an age to transfer sufficient data. Utterly hopeless. I soon used up the meagre allowance, but to be fair to the hotel I was immediately given a new quota. The room was at the end of the corridor and there is a busy road outside, the noise from which was obtrusive even with the windows closed. The hotel charged my card when I booked, and when I queried this I was told it was beyond their control. They even tried to blame booking.com. When I said I frequently used booking.com and this had *never* happened before I was told I must be wrong. My advice to anyone staying in Girona is to choose the Palau Bellavista or the Nord 1901 which are of a similar standard and have none of these problems. I frequently visit Girona and I will never stay at the URH again. High standard of cleanliness and comfort. Close to transport links. Not enough stations in English on the telly! Very stylish, handy for city centre, restaurants nearby, supermarket across road. Great bar & pool on roof. Secure on-site parking. Great value. not a lot ! possibly not easiest to get to if no car. The rooms were nicely decorated and very comfortable. There is a nice lounge area on the roof top and with about 15 min. of walking you are in the cosy centre of girona! Poolsize is small and there are only 8 sunbeds. Actually we were just spending one night between flights so everything was perfect. There is free parking outside the hotel and a lot of restaurants/bars in the city center within 5 mins walk. Excellent hotel. Modern design. Strongly recommend! Stylishly designed hotel and room. Easy access to the city centre - 10 minutes walking. Rooftop terrace good for sunbathing. Supermarket nearby. Free street parking within 100 metres. Poor aircon - not strong enough. The staff were very helpful, the rooms smart and clean, beds very comfortable and a very good restaurant. The pool bar was closed when advertised as open. this hotel is situated in 10-15mins flat walk to all the sites. It used to be an NH hotel. The room was very comfortable with good beds. The breakfast was good. 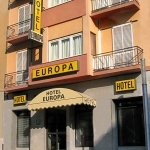 Central location,great roof top area.great gin n tonics.modern design.very comfortable beds.changed Rooms as air con not very good.no problems.great staff very accommodating.late check out at 5.50 euros per night great. Pricey drinks.air con not powerfull enough. Very helpful and friendly staff. Great room. Good pool. Child and baby friendly staff. Good restaurant. Not easiest to find but worth it when we did! Parking is charged 14 euros per day but, if you are lucky to find an empty parking slot in front of hotel then is for free. Modern, clean rooms. Very friendly staff. Restaurant was a bit expensive considering the portion sizes. Modern design of rooms, clean and cool. Close to train station and pleasant walk into town. Loved the roof terrace and pool, lovely breakfast selection, staff were very helpful! The air conditioner cannot be turned off!!!! The room was too cold as a consequence.The pool on the top roof is too small. The cleaniness, good service, the terrace and pool very relaxing, big comfortable beds. Stylish! The fact that there are some rooms where smoking is still alloud. I'd prefer a building free of smoke. the terrasse/bar on the roof of the hotel, swimming pool, balcony with terrasse. 2 single beds instead of big bed as requested during the reservation, Some broken lamps and ceramics in the swimming pool. The hotel was so clean and modern and the staff were very friendly. The one waitress for restaurant & bar was very overstretched. Nice room, comfortable. Bit out of the way but also away from the cathedral bells that chime all through the night. Nice relaxing area on the roof. Not enough staff on reception, took ages to check in, and if you wanted to ask a question you had to wait in the queue for the one person on duty. Location is great: quiet, 10min walk to old city. Hotel is almost new with underground parking, rooms are big, clean and bright. Staff young and ready to help, advise. Water in swiming pool on top of the hotel was dirty. The design of the rooms and the staff were very friendly and helpful. That fact we booked a double room and we had two single beds. Nice hotel with great rooms and stylish public areas. Breakfast was very good. Hotel was let down by unhelpful and rude reception staff. I would not return to this hotel. Great staff, fantastic pool and very good breakfast, very modern rooms. Really nice room and bathroom. Lovely hotel.Bed although twin and not double, was wonderful. The rooftop pool was not open yet and we couldn't use the area at all to sunbathe.We had returned in the afternoon to do this,only to find this information out. Not at check -in or more importantly on the website. Iliked the friendly staff,theclean and comfortable roomand the view from our room 521. As the pool area was being refurbished it was a shame we couldn't use this area. I had asked for a double bed and we were given a bedroom with twin beds, very uncomfortable, by the way. An impressive amount of work had one into design of lights, chairs etc. Nice contemporary decor. Sadly this didn't make up for the hotel's deficits. I was kept waiting 40 minutes to check in and the staff were then rude. I have nevere experienced this poor standard of reception in my life. This was totally unacceptable. The swimming pool was out of action, which was not mentioned when I booked. In fact, this was one of the reasons I booked here. I think this is false advertising. The walls were paper thin and I could clearly hear my neighbour snoring/talking. Slippers were provided but no dressing gowns. At booking it was clearly stated that dressing gowns would be provided. 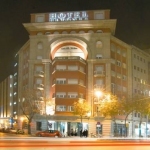 The hotel was a good 15-20 minutes walk from the centre of Girona and difficult to find, being located in a residential area. I would NOT stay in this hotel again, nor recommend it to others. Very good choice. Nice decoration, lighting, bathroom. Quiet neighborhood, 10 minutes walking from bus/train station. 20 minutes walking from old city. We enjoyed our stay. We asked for a double bed and instead there was two single. Otherwise everything was perfect. The Room is great with a fancy decoration and very well maintained. We stayed in the first floor facing the street and it was very quiet. As in most hotels in Spain they charge you the breakfast. Hotel was very clean, room excellent, bathroom great. Fantastic hotel in a beautiful city. Immaculate room, helpful and friendly staff and less than 10 minute walk to the delightful old city centre. Great value for a 4 star hotel, would absolutely book again.